Do you make New Year resolutions? And, do you keep them? Or, are you the type person who has an aversion to goal setting? Maybe you are someone who has a big dream. Or, do you have that annoying habit which you’d wish you could stop? 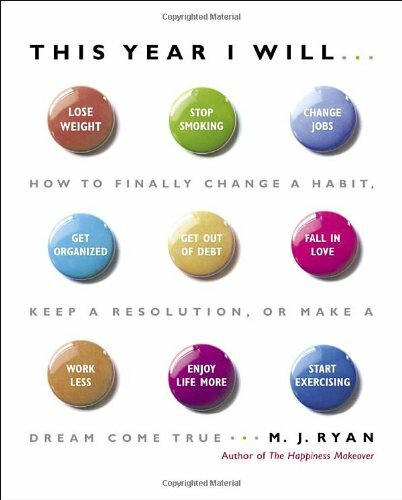 This Year I Will … by M. J. Ryan has cracked the code to successfully implement new habits, achieve goals and realise those dreams. M. J. Ryan holds the key to unlock the secret to make change which sticks. This is the critical point. Until we can change the frequency pattern of our brain, dig out a new neuron path, shift some cemented mind sets, then we cannot expect any change to last more than a few days. Our brain is so much smarter than ourselves! We are reminded yet again, like so many other books I’ve devoured, that we have several brains and this is part of the secret. You need to be able to know which brain (Reptilian - instinctive, Limbic – emotional which seeks pleasure or Neocortex – thinking and reasoning) to talk to. You need to connect emotionally – making it feel the importance of what you want to achieve. If you don’t, it’s not worth pursuing. If you convince your emotional brain that it feels great being thin, you will have a better chance than telling it that it’s a huge challenge not eating chocolate for 90 days! We all know that setting goals is associated with changing and most of us raise our eyebrows when the importance of a SMART goal is emphasised by gurus (like me!) And now I know why! It’s almost impossible. It’s tough, it’s an uphill challenge and we don’t make it a fun and enjoyable journey. However, making your goals SMART is increasing the odds of building momentum in changing a habit. In particular, breaking down the goal and rewarding yourself when the small components are achieved. On saying all this, you’ve really got to want to change. There is no use borrowing a goal if it sounds like a good one, or accepting an imposed goal from your manager. This Year I Will, will help you clarify your change, resolution and dream. · The key to making change stick is your ability to persist with awkwardness. This assimilates to the stretch zone in the change model ‘comfort, stretch and stress’. We don’t change if we stay in our comfort zone. · We need to motivate ourselves positively by creating positive images of what you want to go toward – make it pleasurable. If you tell yourself, ‘Don’t think of donuts! I bet you’ll keep thinking of donuts. · Similarly, create new frames – a new story to live to. Our mindsets structure how we think. Stories we tell ourselves about life which get confirmed over and over and we filter out conflicting information which could be facts. · It’s important to pay attention to strong feelings towards the process of change; differentiating these between thoughts (stories you tell yourself), images (what can you see), feelings (what are you experiencing) and sensations (located in your body). If you practise recognising these, and naming them, you stall your reaction and potentially prevent acting on them. 1. Name your year, month or week of what you focus on – e.g. The year of saying “No”. 3. Write a contract with yourself or significant other to hold yourself accountable. 4. Increase your awareness of the time between your impulses and your action – research tells us it’s half a second. Stretch it out and you may stop the action. 5. Complete a post-game review – analysis everything you do so you can do better next time. Reflection accelerates learning. I found many components of this book reinforced what I’ve studied, practised and experienced and it’s identified another ten books to further explore, read and learn from. I look forward to hearing from you if you’d like to change a habit, keep a resolution or make a dream come true. I have the tools of the trade and many clients generously keep in contact with me advising of their journey to keep focused by using the many tools, thoughts and models which I continue to refine. Setting Goals is a challenge - find some relief within these pages.